Can the community and university find a better way to promote civil dialogue? 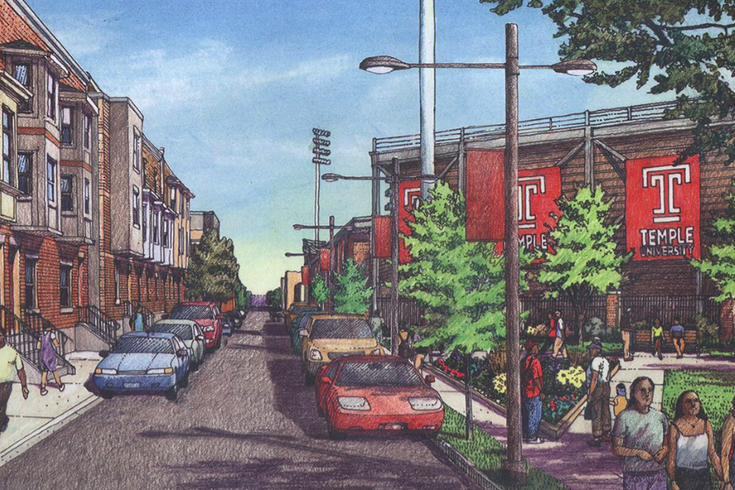 Street view rendering alongside proposed football stadium at Temple University. Two years after announcing plans to explore the construction of a 35,000-seat stadium in North Philadelphia, Temple University's first public town hall on the controversial project was cut short Tuesday night when community protesters disrupted and overtook the on-campus meeting. 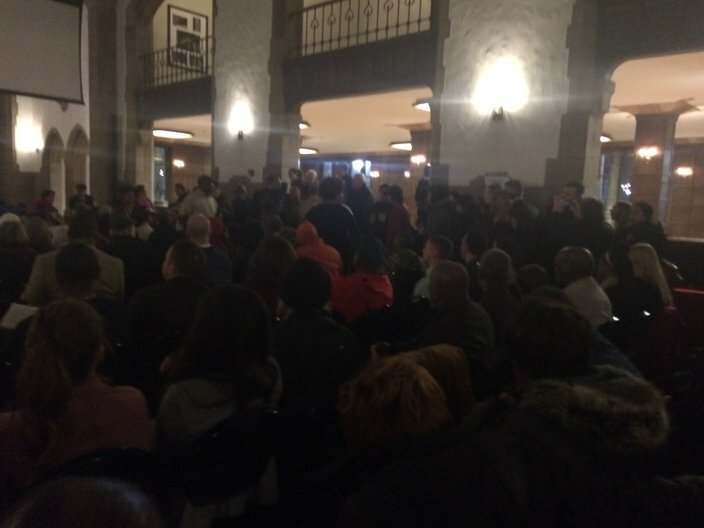 The scene at Mitten Hall was chaotic and tense, an unsurprising outcome given the sustained opposition lodged by neighborhood groups to the proposal since the university launched a $1.25 million feasibility study in February 2016. To say that the night was entirely counterproductive would be inaccurate. The meeting exposed, in one place, the emotional stakes that underly the neighbors' distrust of the university. 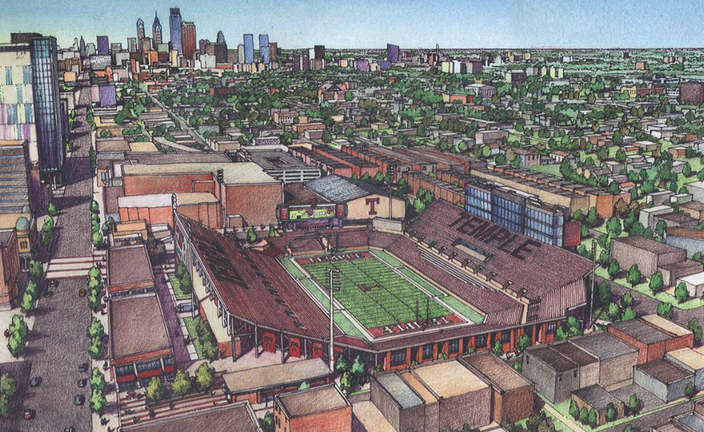 It also revealed more about Temple's rationale and expectations for the project. "It makes sense financially," said Temple President Richard Englert said in his introductory remarks, which lasted about 10 minutes before he was interrupted and protesters shut down the event. "While we have valued our leasing arrangement at [Lincoln Financial Field], it has become very apparent that any future long-term lease will be much more expensive than we can afford." The $130 million proposal, drawn up at a site bounded by Broad Street west to 16th Street and Norris Street south to Montgomery Avenue, represents an attempt by the university to assume fixed costs for its own football program. "Building and owning our own facility means substantial savings over leasing the Linc," Englert said. "This translates into more dollars for investment for other purposes." In December 2016, Temple declined to sign a 30-year lease at the Linc after the Philadelphia Eagles doubled the cost to $2 million per year. The university opted instead for a short-term extension through the 2018 season. Building a stadium, Englert claimed, will help Temple realize savings that can be reinvested in the university's educational mission, including classroom space and research. "The facility will include a stadium which will host no more than seven college football games per year," Englert said. "There are no plans for concerts or similar events, however, we do think it could be a venue for an annual public league championship football game or other appropriate community activities, such as neighborhood youth camps." Temple has already received multiple inquiries from retailers about potential opportunities in the project's commercial space, Englert added. "Hundreds of construction jobs will be created in the construction phase of the project," Englert said. "And a minimum of 100 more full-time and part-time positions will be filled by retail establishments, game day and stadium operations." To the protesters who feel they've heard the speech before, Englert's words didn't strike them as anything more than ambition masked in a collection of platitudes. The underlying tension at Tuesday night's meeting surrounds what many North Philadelphia residents feel is Temple's history of ignoring the community and breaking its commitments. Englert held the duty of justifying the stadium while acknowledging the need to work more closely with the community. "I understand that we need to do a better job of listening to our neighbors," Englert said. "We need to have better communications with our neighbors. We have to make certain that we don't make promises we can't keep." 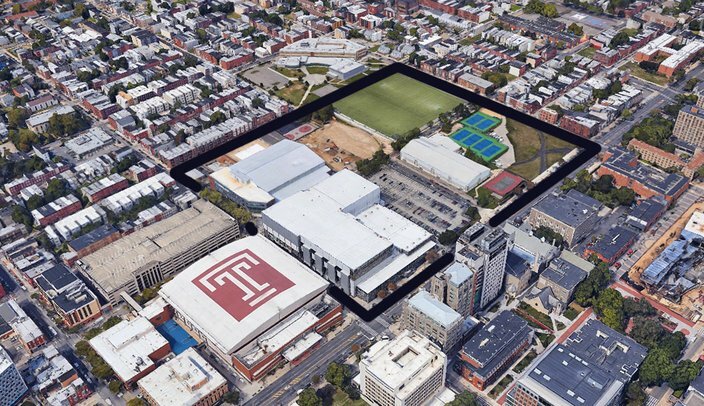 The borders of the stadium proposal fall completely within Temple's existing footprint, a point Englert emphasized as he claimed the stadium would not directly displace any residents. Moody Nolan, the architectural firm hired to design the stadium, was also instructed to situate the field below ground level so that its rafters would be adjacent to the roof lines of surrounding rowhomes. But the stadium would force the closure of 15th Street at Norris Street for half a block, with an opening at Montgomery Avenue to enter the facility, creating what neighbors feel will be a traffic nightmare. They were deeply skeptical of Englert's claims about residential displacement. "Temple cannot control the entire system of gentrification that has displaced impoverished people for centuries," said the Rev. William Brauner, who is aligned with local resistance group Stadium Stompers, the Black Clergy of Philadelphia and the NAACP. "Temple has no control over that. Temple doesn't say, 'Oh, we don't want people to sell their homes more or have higher taxes. Temple has no say-so in that. That's a lie." Englert attempted to assuage the fears of neighborhood residents by noting the creation of a Special Services District (SSD) that would be run by a community board and funded by the university. The SSD, much like similar zones in Old City, West Philadelphia and Germantown, would increase city maintenance and policing around the proposed stadium — prospects that increase many neighbors' wariness of the project. In terms of concrete steps for the community in North Philadelphia, Englert outlined five initiatives he said would accompany progress on the stadium. Temple's College of Education, Englert said, will finance an "Alpha Center" to be constructed on university property at the northwest corner of 13th and Diamond streets. It would provide critical early learning, mental health, dental and job training resources for the community, as well as research and training for students and faculty, he said. The long-discussed Laborer's Union training facility, slated for a location near Broad and Master streets, is also still "in the works" and progressing, Englert added, eliciting groans from residents. In collaboration with Temple, he said, the laborers would make training opportunities available to the community for the first time. A more comprehensive workforce development initiative for the neighborhood is currently taking shape, Englert said, and more detailed information can be expected in the coming months. Even the Amos Recreation Center on North 16th Street, once feared to be a casualty of the stadium, would receive a major investment from Temple, according to Englert. Finally, he claimed, North Philadelphians would have access to the university's new state-of-the-art library. "Improved relations between the university and our neighbors must be built on trust," Englert said. And those were his final words before the town hall broke down for the second and final time. Protesters line the far side of Temple's public town all on the proposed football stadium in North Philadelphia. 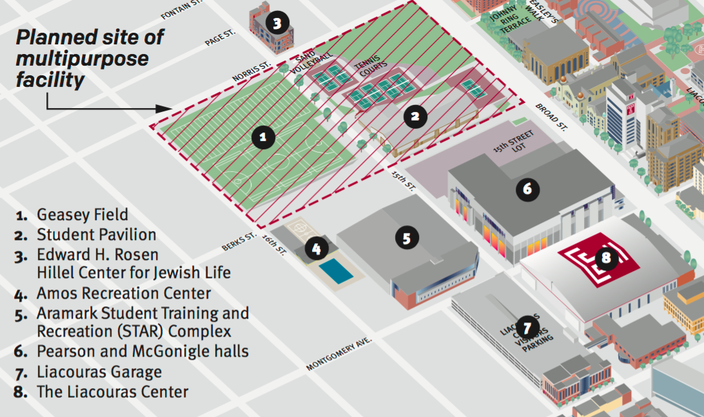 What comes next for Temple's public plans and interaction with the community remains uncertain. Architects who were to detail the stadium's design were unable to address the audience on Tuesday night, a missed opportunity to learn more about what Temple will submit to the City Planning Commission. The university has claimed the stadium will be funded primarily by private donations and bonds, but financing for the project went unaddressed at the town hall. As they left the podium, Temple officials said they would provide information about a different format for community meetings in the future. The event's moderator suggested smaller groups, though it's unclear if such discussions would be open to the public. "We were disappointed that because of the actions of a small group of organized protesters, we were not able to present full details of the proposal and address important concerns that have been raised by community members," a university spokesperson said Wednesday. "However, we were pleased to see the majority of those in the room were eager to learn more. Our commitment to continuing the dialogue with local residents has not changed. We will continue the conversation in the weeks ahead." Temple police Chief Charles Leone said he was hopeful about improving dialogue in the future. "It's always possible," Leone said. "You have to leave the door open. The next time, I would really hope that there would be more opportunity for people to ask their questions and get their answers and rebut, but in a way that everyone's respectful for each other." Protesters, who bristled at Temple's decision not to attend their own town hall last week, vowed to organize another community meeting in the near future. There were no details immediately available. The jury is still out about how Tuesday night's outcome will affect public perception of the stadium plan. The stadium is proposed for the west side of Broad Street, just north of the Liacouras Center (seen with T on the roof). The property is owned by the university. For those who oppose the project by shutting down conversation, the victory may be Pyrrhic if these tactics leave the distinct impression that Temple hasn't had an opportunity to present a complete case to them. And what if the university now retreats into secrecy? It's also not yet clear, going forward, whether the message of resistance to the stadium will be uniform. Judith Robinson, a North Central Philadelphia homeowner and representative of the 32nd Ward Registered Community Organization (RCO), is highly skeptical of the stadium's value but also expressed some doubts about the protests. "I am concerned that most of the protesters are not the most affected [by the stadium]," Robinson said. "The few that are homeowners do not reside near the proposed sites and the others [who are] most vocal are not residents at all. None of the ministers live in North Philly." Robinson said it was a shame that local residents most impacted by the stadium didn't have an opportunity to ask questions and state their objections. She fears the curtailed town hall will give Temple a pass to proceed as it did years ago with the construction of the Liacouras Center — then Temple Apollo — which broke the community's good faith understanding that the university wouldn't build west of Broad Street. "It appears that bad public relations advice will allow Temple to move forward without engagement of the homeowners of North Philly, continuing a relationship of distrust and ongoing animosity," Robinson said. "There is a lot of bad history between the relationship with Temple and the community." Whatever shape the opposition takes as the university charts its next moves, Tuesday night made it abundantly clear that there is an impasse based on factors that go well beyond the stadium, a project many residents feel would compound their co-existence with a growing university. As one protester said, the two sides have yet to step into the same arena. "I think it's really necessary for us to point out the fact that when we talk about being respectful, and having to try to contain ourselves, and what's an appropriate way to act, we're not playing in the same field anymore," said Phil Gregory, a member of Stadium Stompers. "Temple is playing in the realm of profit. We're playing in the realm of survival."